With the rapid growth of STEM in schools, our Merit Certificate program is growing each year. 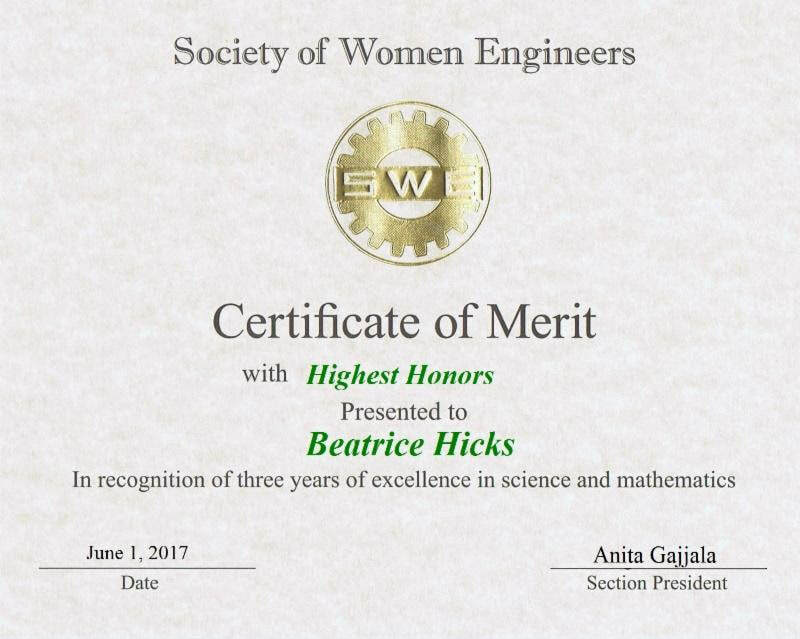 Over 100 high schools and middle schools in the Boston and Southern NH sections have requested and received SWE Merit Certificates to recognize girls who have excelled in their Math and Science classes. Several schools have requested a SWE representative to present the Merit Certificates to the recipients at their annual awards ceremony. This one-time task typically takes only an hour or two of your time. The actual presenting takes about 5 minutes, and generally presenters are present for the entire awards ceremony, plus your travel time to and from the school. We can provide you with a script if you are unsure what to say. The award recipients are female students who have excelled in math and science, and receiving an award from SWE is almost always the first exposure to SWE, and perhaps to engineering, the students have had. These students may very well be our next generation of SWE members! Having an actual SWE member present the award is greatly appreciated by the school's faculty.